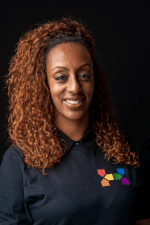 A first generation Ethiopian American and Native Marylander, Obsetee Korme has been a proud Jersey City resident for the last 9 years. She is a huge supporter of local businesses, thriving art and culture communities as well as passionate about her monthly ground maintenance volunteer work at the Historic Jersey City & Harsimus Veterans Cemetery. While currently a Brand and Packaging Specialist in Home Fashions, Obsetee has had a broad range of experience in the philanthropic and nonprofit world, ranging from community organizing to grant writing and reporting; most recently for the grassroots organization Mothers In Charge in Philadelphia, PA, a non-profit violence prevention, education and intervention based organization that supports communities and families that have lost loved ones to gun violence. She has also spent the last two years consulting as a life coach and mentor and hopes to continue to pursue this quiet passion. Obsetee joined the Board of Hudson Pride Connections Center in 2017 and now holds the title of Board Secretary. She is looking forward to contributing her perspective, skills and time to advocating for all LGBTQ issues facing Jersey City, Hudson County and the entire state of New Jersey. Her mantra has always been to live your best life while helping others.